No good deed goes unpunished when someone who’s “just doing their job” has something to say about it. After a Christmas storm dropped a bunch of snow on Pocatello, Idaho, Mitch Fisher went out and did the neighborly thing by using his ATV to plow the snow from the streets around his neighorhood, where according to him most of the residents are elderly people that are unable to deal with the snow themselves. Unfortunately, as he was in the process of doing so a local Revenue Collector happened upon his act of kindness and decided he needed to be extorted a little bit. Apparently, Fischer had made a pile with the snow that had been plowed in front of his own house. In spite of the fact that the reason that pile was there was because he had moved all the snow out of everyone else’s way, that violated the letter of a law within the city codes of Pocatello. And for that he had to be punished, regardless of the circumstances involved. It’s obviously a good thing that a Brave Hero in Blue was there to step in and protect those people from a friendly neighbor helping to make their streets safer during winter. Whenever it snows, Mitch Fisher is ready to help his neighbors, whether it’s clearing the sidewalks or trying to clear the street. When the area’s Christmas storm hit, he was out plowing his street with his ATV. “I take care of the neighbors. They’re all elderly and I like to help them out,” Fisher said. On Wednesday, however, a Pocatello police officer cited Fisher for an infraction — placing or depositing material on a public right of way. It carries a cost of more than $200. Fisher said he was baffled by the situation. Chapter nine of Pocatello’s city code states, “It is unlawful for any person to deposit, place or allow to remain in or upon any public right of way any material or substance injurious to persons or property.” In this case, “public right of way” means the street. Fisher argues he wasn’t moving the snow back into the street, but that he was doing the opposite. He moved the snow into a pile right next to his curb. “I didn’t want it in front of (my neighbors’) houses because they can’t park. I don’t care if it’s in front of mine,” he said. 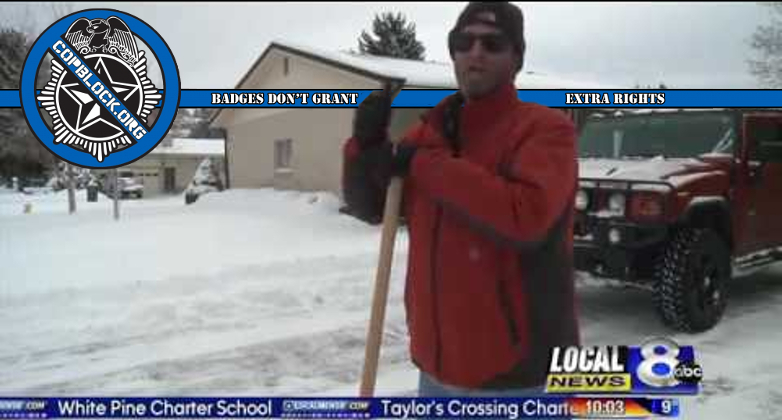 Despite the hefty price tag of his citation, Fisher doesn’t plan on stopping his snow removal efforts. “I’ll keep doing what I’m doing. I don’t care about the city,” he said. Fisher plans on contesting the ticket, hoping to show he wasn’t violating city code. It is good to see that Fischer plans to fight the ticket, since most of these type of revenue generation based tickets are predicated on the idea that the person being preyed upon will just pay the fine and not be willing or able to take it to court.